Ava Helen Miller, the tenth of twelve children, was raised on a 160-acre (0.65 km2) farm outside Beavercreek, Oregon. Her father, George Miller, a school teacher, and her mother, Elnora Gard Miller, expressed socialist ideals and encouraged liberal thinking and discussion in the home. Linus Pauling explained, "Ava Helen had been interested in social, political and economic problems ever since she was a teenager. She used to argue with a friend of the family, one of the judges of the Oregon State Supreme Court. She had a general interest in science and was very able, very smart, but she was really concerned about human beings. The humanistic concern she had was very great." At the age of thirteen, two years after the divorce of her parents, Ava Helen moved to Salem, Oregon, to live with her sister. She graduated from Salem High School in May 1918, three years after entering, and then enrolled in the Oregon Agricultural College, now Oregon State University. It was at OAC in 1922 that Ava Helen Miller first met Linus Pauling. As an undergraduate, he taught a chemistry course to home economics majors. Ava Helen Pauling was enrolled in this course and it was through the student-teacher relationship that they became romantically involved. After a brief courtship, the two were married on June 17, 1923. In the early years of her marriage, Ava Helen Pauling worked as a part-time laboratory assistant at the California Institute of Technology for her husband by taking notes, making models and completing other small tasks. Eventually, the couple had four children: Linus Carl Jr. (b. 1925); Peter Jeffress (1931–2003); Edward Crellin (1937–1997); and Linda Helen, (b. 1932). As the family grew, Ava Helen Pauling worked to create a home environment that would allow her husband to continue his scientific work without domestic distractions. Both Ava and her husband were atheists. After the Japanese attack on Pearl Harbor on December 7, 1941, the United States government proposed the internment of all west coast Japanese and Japanese Americans in inland camps out of fear of espionage. Ava Helen Pauling vigorously opposed this decision by joining the American Civil Liberties Union and working to raise awareness about the government action. When asked by the ACLU, she and her husband provided employment for a Japanese-American man recently released from an American internment camp. Subsequently, the Pauling family was plied with criticism for what were seen as pro-Japanese actions. The Paulings, however, continued to support the rights of Japanese-Americans throughout World War II. The Union Now movement arose from the publication of Clarence Streit's novel Union Now, which encouraged nations to combine into a democratic federation. Ava Helen Pauling advocated this movement and encouraged her husband to become educated on Streit's philosophy. As a result, Linus Pauling became publicly involved in the cause, eventually joining the Pasadena chapter of Federal Union, the organizational outgrowth of Union Now. In 1940, thanks in part to Ava Helen's suggestion, Linus Pauling gave his first political speech, urging his audience to consider Union Now as a movement toward a viable system of government. This effectively began Pauling's career as a public proponent of peace and human rights. Ava Helen was deeply involved in the movement for women's rights. Following World War II, she became a member of the Women's International League for Peace and Freedom, or WILPF, Women Strike for Peace and Women Act for Disarmament, an international federation of women's groups in which she held the position of honorary chairwoman. She also worked to bring together fellow activists in support of women, helping to organize the "Women's Peace March" in Europe. In addition to her membership in various women's organizations, Ava Helen served as three time national vice-president for WILPF, one of the many women-led groups that supported the Paulings' peace efforts. I, in talking with [Linus] thought that it was of course important that he do his work, but if the world were destroyed, then the work would not be of any value. So that he should take part of his time and devote it to peace work as we called it. I felt a little guilty about this because of course I knew very well what great and deep pleasure he got from his scientific work, how competent he was in his scientific work, and how enthusiastic he was about it. Ava Helen Pauling died on December 7, 1981 after a long battle with stomach cancer and subsequent internal hemorrhaging. In recognition of her efforts for peace and equality, Oregon State University's College of Liberal Arts established the Ava Helen Pauling Lectureship on World Peace, now known as the Pauling Peace Lectureship, in 1982. The inaugural lecturer was Linus Pauling and subsequent lecturers have included Paul Warnke, Helen Caldicott, Noam Chomsky, and Arun Gandhi. Additionally, the Linus Pauling Institute chose to honor her with an endowed position, the Ava Helen Pauling Chair, in 1996. Doctor of World Law, San Gabriel College, June 19, 1962. Honorary Member: Federated Auxiliaries of the International Longshoremen's and Warehousemen's union, June 21, 1967. Mother of the Year Award: California State Association of Colored Women's Clubs, Emma Lazarus, and Jewish Women's Clubs of Los Angeles, 1967. Certificate of Appreciation: Anza-Borrego Committee of the Desert Protective Council, December 20, 1974. Ralph Atkinson Award of the Monterey County Chapter of the ACLU. Spectrum Award and Medal: World Organization for Human Potential, May 4, 1984. Janice Holland Award of the Pennsylvania Chapter of the Women Strike for Peace. ^ a b Hager, Thomas (1995). Force of Nature: The Life of Linus Pauling. Simon & Schuster. p. 69. ISBN 0-684-80909-5. ^ a b Chris Petersen; Cliff Mead (2006). The Pauling Catalogue, Vol. 3. Oregon State University Libraries Special Collections. p. 193. ISBN 0-9629082-6-6. ^ "Quotes by or Related to Ava Helen Pauling (Quote 4 of 8)". Oregon State University Libraries Special Collections. Retrieved 2007-12-18. ^ Paradowski, Robert J. (1991). Linus Pauling: A Man of Intellect and Action. Cosmos Japan International. p. 191. ISBN 4-938264-01-3. ^ Thomas Hager; Cliff Mead (2001). Linus Pauling: Scientist and Peacemaker. Oregon State University Libraries Special Collections. pp. 5–6. ISBN 0-87071-489-9. ^ Chris Petersen; Cliff Mead (2006). The Pauling Catalogue, Vol. 3. Oregon State University Libraries Special Collections. p. 188. ISBN 0-9629082-6-6. ^ "Research Notebook 002, Page 81". Oregon State University Libraries Special Collections. Retrieved 2007-12-18. ^ Hager, Thomas (1995). Force of Nature: The Life of Linus Pauling. Simon & Schuster. p. 173. ISBN 0-684-80909-5. ^ Hager, Thomas (1995). Force of Nature: The Life of Linus Pauling. Simon & Schuster. p. 174. ISBN 0-684-80909-5. ^ Daisaku Ikeda; Linus Pauling (1992). A Lifelong Quest for Peace: A Dialogue. Jones and Bartlett. p. 10. ISBN 0-86720-278-5. ^ "https://paulingblog.wordpress.com/2010/07/29/the-paulings-and-unitarianism/." (n.d.): n. pag. Web. "both Linus and Ava Helen Pauling were avowed atheists"
^ "Anonymous Anti-Japanese Note to Linus Pauling. March 7, 1945". Oregon State University Libraries Special Collections. Retrieved 2007-12-19. ^ ""Jap Flag Painted on Garage Door." March 7, 1945". Oregon State University Libraries Special Collections. Retrieved 2007-12-19. ^ "Transcript of an Anonymous Letter Sent to Linus Pauling. March 9, 1945". Oregon State University Libraries Special Collections. Retrieved 2007-12-19. ^ "Anti-Japanese Sentiment". Oregon State University Libraries Special Collections. Retrieved 2007-12-18. ^ Chris Petersen; Cliff Mead (2006). The Pauling Catalogue, Vol. 3. Oregon State University Libraries Special Collections. pp. 206–208. ISBN 0-9629082-6-6. ^ Chris Petersen; Cliff Mead (2006). The Pauling Catalogue, Vol. 3. Oregon State University Libraries Special Collections. pp. 201–202. ISBN 0-9629082-6-6. ^ a b Anitra Carr, Ph.D. "Ava Helen Pauling". The Linus Pauling Institute. Archived from the original on 25 December 2007. Retrieved 2007-12-19. ^ "Linus Pauling and the International Peace Movement Narrative: Peace Groups". Oregon State University Libraries Special Collections. Retrieved 2007-12-20. ^ Hager, Thomas (1995). Force of Nature: The Life of Linus Pauling. Simon & Schuster. pp. 505, 515, 537. ISBN 0-684-80909-5. ^ "Reluctant Pauling Gets Ultimatum on Petition". Oregon State University Libraries Special Collections. Retrieved 2007-12-19. ^ "Linus Pauling and the International Peace Movement: The Right to Petition". Oregon State University Libraries Special Collections. Retrieved 2007-12-20. ^ "The Peace Prize..." Oregon State University Libraries Special Collections. Archived from the original on 17 December 2007. Retrieved 2007-12-19. ^ "Linus Pauling, Crusading Scientist: Encouragement from Ava Helen". Oregon State University Libraries Special Collections. Retrieved 2007-12-19. ^ Chris Petersen; Cliff Mead (2006). The Pauling Catalogue, Vol. 5. Oregon State University Libraries Special Collections. p. 8. ISBN 0-9629082-8-2. ^ "Ava Pauling, 77, Wife of Scientist". Oregon State University Libraries Special Collections. Retrieved 2007-12-19. ^ Stauth, David (2001-01-18). "Genetic, Biomedical Researchers Join OSU" (PDF). OSU This Week Vol. 40 No. 15. Oregon State University. Archived from the original (PDF) on September 4, 2006. Retrieved 2007-12-19. Hager, Thomas, Force of Nature: The Life of Linus Pauling, Simon & Schuster (1995) ISBN 0-684-80909-5. Ikeda, Daisaku & Linus Pauling, A Lifelong Quest for Peace: A Dialogue, (1992) ISBN 0-86720-278-5. Mead, Clifford & Thomas Hager, Linus Pauling: Scientist and Peacemaker, Oregon State University Libraries Special Collections (2001) ISBN 0-87071-489-9. Paradowski, Robert J., Emile Zuckerkandl, Joseph Rotblat, Itaru Tanaka, Fumikazu Miyazaki, Z. S. Herman, & D. B. Munro, Linus Pauling: A Man of Intellect and Action, Cosmos Japan International (1991) ISBN 4-938264-01-3. 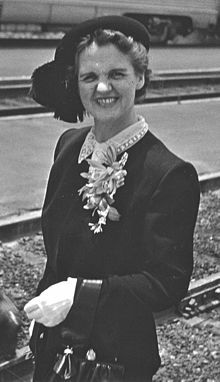 Wikimedia Commons has media related to Ava Helen Pauling (activist).